If you've ever sat staring at an empty container waiting for inspiration to strike, then this blog entry should help. 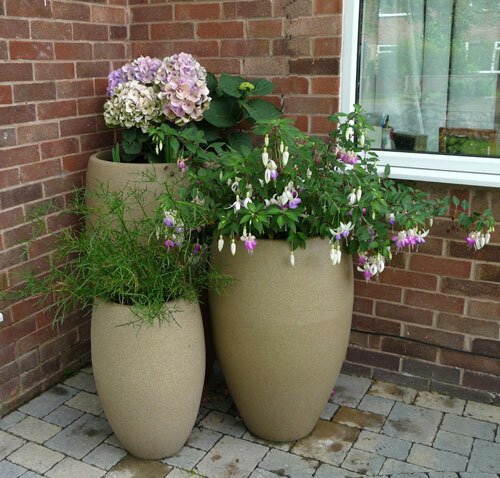 This entry is on planting a shade container. Hope it helps! The photo left shows a concrete planter pot that stands at the entrance to a shady courtyard. The deep rich burgundy color of 'Big Red Judy' coleus provides the backdrop for the soft yellow and muted red of 'Gay's Delight', making it the true star of the show. Tucked in at the edge of the container, the crazy quilt pattern of tine 'Pink Chaos' adds just enough extra color to bring the eye downward to the anchor plants, which are special in their own right. Transitioning from the height of the taller plants, the shorter growing Rumex leads you to the dark metallic-looking leave of 'BlackScallop' ajunga. Last is the spilling creeping vine coming off the outer edge of the planter, which softens the effect of the bolder shapes above. Stunning! Always start with good potting soil and add moisture beads at the time of planting to ensure that thirsty plants like coleus get wheat they need to look their best. 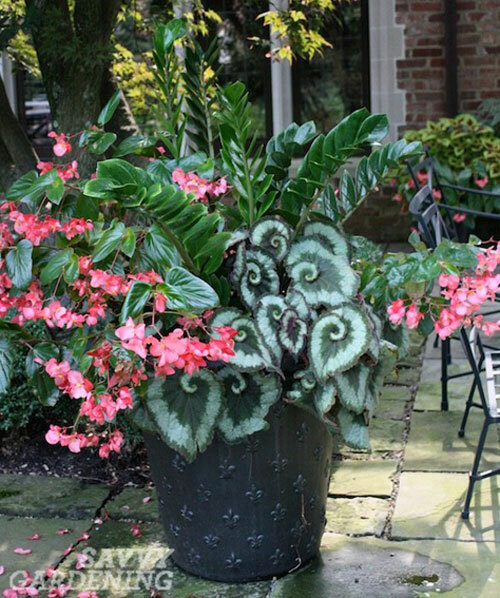 Since this is primarily a foliage container, using a high nitrogen fertilizer regularly during the season will promote leaf growth and discourage strength sapping flower spikes. Coleus will attain a fuller shape with frequent pinching of their terminal leaves; Big Red Judy in particular can outgrow her companions without a little helpful pruning. 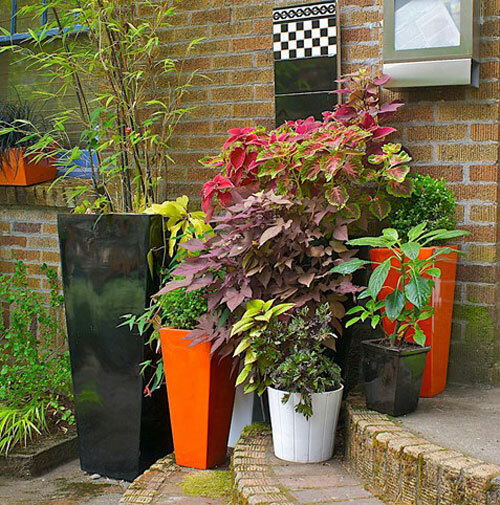 Check the ultimate growth height of each coleus you plant, placing the shorter variety close to the front of the plant container so they don't become overshadowed by the more aggressive plants.